UAAP Magazine, the official glossy publication of the University Athletic Association of the Philippines (UAAP), releases its third volume this September. In keeping with the “Unbreakable” theme of UAAP Season 75, the magazine honors the league’s finest student athletes from the present and past seasons. Leading the pack are the three fellows on the cover: Allan Caidic from the University of the East (UE), Ren-ren Ritualo from De La Salle University (DLSU), and Kiefer Ravena from Ateneo de Manila University. Three-point shooter Allan, now a coach of Ginebra San Miguel, helped give the UE Warriors three UAAP championships from 1982 to 1985. Allan was also chosen as Most Valuable Player during his sophomore year. Ren-ren, also a pure shooter like Allan, led DLSU to four straight wins from 1998 to 2001. This former college hardcourt hero-turned-professional cager is one of only three Green Archers to have his number retired by his Alma Mater. Meanwhile, current sensation Kiefer is touted to be one of the best players that Ateneo has ever produced. The cover story focuses on their challenges and best moments in the UAAP. The magazine also shows what it’s like to grow up in a basketball-crazy family through anecdotes shared by Freddie, Jason and Joshua Webb, and Alvin, Jeric, and Jeron Teng. Basketball analyst TJ Manotoc dissects how the entry of foreign players has affected the league while former Smart Gilas Team Captain Chris Tiu gives advice to student-athletes. There is also a detailed look-back at each UAAP school’s victories and notable players in the sport of basketball. UAAP Magazine introduces the prettiest and most admirable cheer dancers, distinguished football players from the each of the eight schools in the league and other UAAP sports such as swimming, beach volleyball, and badminton. 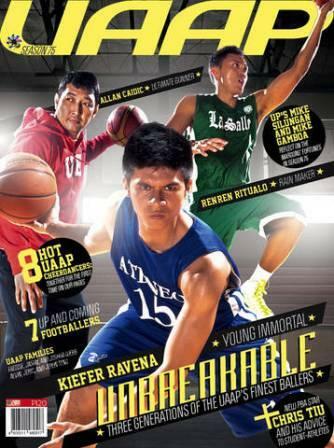 UAAP Magazine is published by ABS-CBN Publishing and is available at leading bookstores and magazine stands nationwide.